My take on a classic American meal. What kind of ground meat? Well... you have to have some beef. You can use all beef, but the meatloaf turns out much better if you have some pork in it too. I like a ½ pound ground pork mixed with one pound ground beef. Or ½ pound each of ground pork, beef, and veal. Or just buy the meatloaf mix that they have in the meat section of your grocery store. Please don't buy bread crumbs. Purchased bread crumbs are usually dried out and pre-seasoned. We want nice soft bread crumbs in our meatloaf. So just make your own. Take regular white bread, and tear a couple slices into bite-sized chunks, then run them in your blender or food processor until they become bread crumbs. This is a good way to use up the crusts (or heals) of your bread loaves. Gently mix all the loaf ingredients together, but don't over mix. Just mix them until everything is combined. Form this mixture into a loaf and put into a loaf pan, or press it into a bowl and turn it out on a sheet pan. Bake for one hour at 350°F. While the meatloaf is baking, in a small bowl mix all the sauce ingredients together. When the meatloaf is done, remove it from the loaf pan and move it to a serving dish. 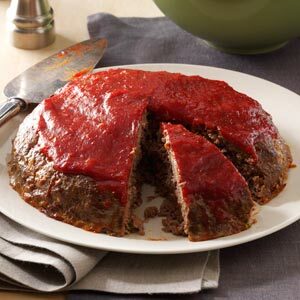 Spread the sauce over the top of the meatloaf and allow it to rest for 5 minutes before slicing and serving.